As I write this it is mid Summer. I feel compelled to write this guide on how to get rid of stinky feet, how to fix feet and proper toenail care since there are a lot of guys that I see wearing flip flops that shouldn’t be. From dry, cracked heels, to fungus infected toenails, to really bad foot odor. It seems like guys just neglect their feet since they are covered up most of the year. What a mistake that thinking is! I’m going to go over a thorough foot care guide for men to get some foot odor remedies to take control of their smelly feet. We’ll talk about the best foot care products for men. And, lastly we’ll dive into some ideas on taking care of your toenails. Don’t think that women don’t notice rough looking feet. They notice everything! Even if you’re not looking to impress anybody, it just makes sense to take care of your feet. You dress well, try to smell nice and keep your hair looking tight. Now, do the same for your feet to complete the package. I’m going to break things down by category in this foot care guide for men. Let’s start with the most obvious of foot problems. That is the most common question guys have when asking about how to take care of their feet. They can smell their feet, or at least others can, so that’s how they know they need to do something about it. Getting rid of sweaty, stinky feet isn’t just a way to cover up the smell. The best thing is to find the source of the problem and treat it so your feet stop smelling to begin with. The same thing that causes any body odor in general. Bacteria loves to eat your sweat and the waste that the sweat is carrying out of your pores. Since your feet are generally covered up in shoes that don’t allow for ventilation, they have plenty of food. Your feet overheat, start to sweat, the sweat has nowhere to go and the bacteria have a smorgasbord. There are two important things, then, that you need to do to keep your feet from smelling. Find out by reading more of this foot care guide for men to make sure the stinky odor goes away. Keep your feet from smelling by wearing the right socks and shoes. And, kill and prevent bacteria from forming on your feet. First, let’s tackle the bacteria issue. After getting out of the shower and having washed your feet, it is time for a soak. 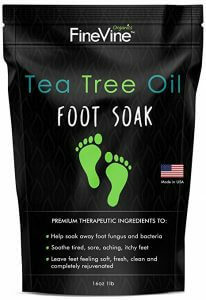 Use an epsom salt based foot soak like Fine Vine Tea Tree Oil Foot Soak With Epsom Salt from Amazon.com. Using Epsom salt for your feet serves a few benefits, but the main feature for us is its ability to neutralize bacteria and is a natural way to get rid of foot odor. This product also uses antibacterial and antifungal agent, tea tree oil for an added boost to kill that bacteria. Doing this soak a few times per week will kill your bacteria, improve your toenail health and kill any athletes foot and will leave your feet moisturized and healthy. It’s one of the important part of foot care guide for men. It also feels invigorating and really soothes your feet. You will feel like you got a spa treatment! All you need is a basin or bowl filled with enough warm water to just cover your feet. Add the recommended dosage and let your feet soak for 15 to 20 minutes. Next, we need to keep the bacteria from coming back. The best treatment for killing and preventing bacteria is to use alum powder. Just like crystal rock deodorant from Amazon.com, alum powder for your feet will kill the bacteria there is already on your feet and prevent them from returning. It creates a layer on your feet that the bacteria cannot survive in. 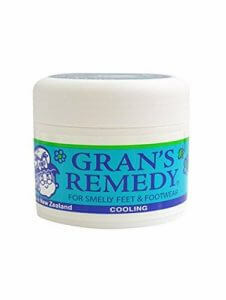 The best foot deodorant that kills bacteria and doesn’t just mask your foot odor is Gran’s Remedy Foot Odor Eliminator on Amazon.com. Using alum powder as its primary ingredient, it disinfects your feet, and closes the pores, just like the alum block you might use on your face after you shave. Put some of this powder on your feet after you do the Epsom salt soak and bacteria doesn’t stand a chance. Use it everyday so on the days you don’t soak your feet it will continue to keep your feet from getting stinky. It is also very invigorating since it has ingredients that cause a tingling and cooling sensation. Your skin will feel a little tight the first few times you use it, but that is a good thing. It just means the skin is tightening as the pores close up. Your feet will actually sweat less when the pores are closed. Use it everyday until the container is empty and it will keep your feet odor free for months if you continue to use the Epsom salt soak in addition. You can even sprinkle some right into your shoes. The next step in our foot care guide for men is to start wearing some moisture wicking and anti odor socks. These Ultra-Thin Lightweight Running Socks by Pure Athlete on Amazon.com will wick moisture away from your feet keeping them dry and sweat away from your skin. In addition, they are great at preventing blisters, especially when running or when wearing new shoes. Your shoes should definitely have the proper ventilation if you are going to wear them all day. Also, wear the right shoes for whatever activity you are doing. Mesh shoes for walking or running will allow your feet to breath and let the sweat evaporate before the bacteria has a chance to do its thing. What about when you need to wear dress shoes for work or boots on the job site? Those are not great at keeping your feet dry. Your best bet is to make sure the shoes are kept dry when you’re not wearing them, and to use some odor eating products. 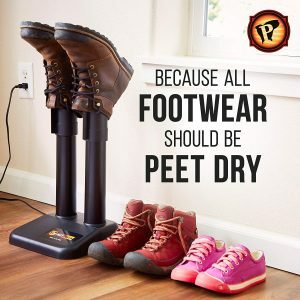 When you get home the first thing you should do is to get them dry ASAP by using this shoe and boot dryer from Amazon.com. This can be used on any type of shoe material. It dries the shoes quickly which helps in keeping them deodorized. Not only that, but it also protects your shoes against mildew which keeps them lasting longer. That’s a side bonus, the biggest reason is to make your feet not smell. While you’re wearing your dress shoes you should be using an antibacterial insole insert from Amzon.com. 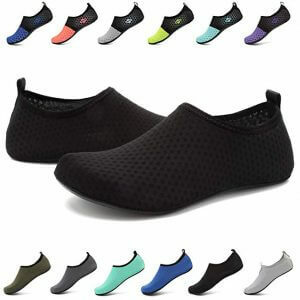 These will keep your feet comfortable and odor free since they will kill any bacteria present. Lastly, put some baking soda in your shoes overnight. That will absorb any odors and also kill off any bacteria in the shoes. Just remember to dump the powder out before you put your shoes on. If you do these steps and follow this foot care guide for men, this will get rid of foot odor fast. In a couple of days your feet will feel and smell very fresh. 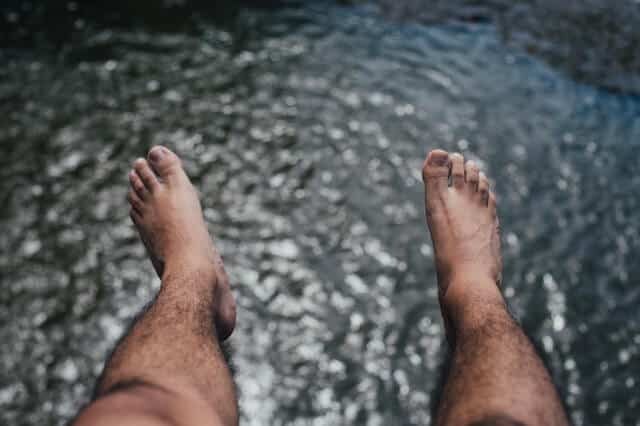 Good foot hygiene is essential to keep your skin from getting dry and this foot care guide for men will help you achieve this. Too dry and you risk those awful, deep cracks in your heel. Which are not only unsightly if you want to be wearing flip flops, but also painful. We’ll focus on two things here. Prevention and cure. If your feet are just starting to show signs of dry skin and are feeling uncomfortable, then we need to take steps to prevent it from getting worse by using some foot grooming products for men. If you already have those cracks in your heels or suffer from dry, flaky skin on your feet then I will go over some of the best men’s foot care products to repair your tired feet. There are two things you need for the best way to smooth feet that are hydrated and healthy. One is to get a good foot scrub to strip away the dead skin. Then you need a foot cream for dry feet to rehydrate. Start with the best foot scrub to remove dead skin. 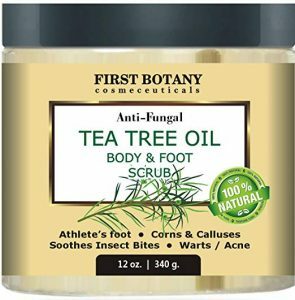 First Botany Natural Anti Fungal Tea Tree Oil Foot Scrub on Amazon.com, is one of the best exfoliating foot scrubs that will leave your feet hydrated and healthier than ever. Dead Sea salts and Epsom salt will clear away the dead skin opening the skin up to be nourished and hydrated, while also killing any bacteria or fungus that cause foot odor. Chamomile essential oil soothes the feet and jojoba oil will replenish the moisture to keep skin from drying out. If you suffer from athlete’s foot, or other fungal infections, then this is a great natural remedy against that. Next up is a moisturizing foot cream. 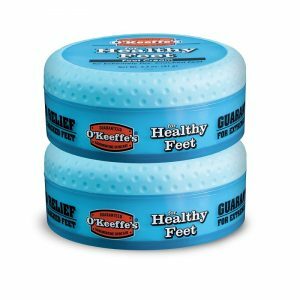 The best foot cream for dry feet has got to be O’Keeffe’s for Healthy Feet Foot Cream on Amazon.com. After your feet have been scrubbed and detoxed with the Epsom salt and Dead Sea salts, then you need to make sure they stay soft, smooth and hydrated to prevent any rough skin and cracks. Since foot skin is much thicker than anywhere else on our body, O’Keefe’s formulated this foot cream with glycerin and Allantoin to penetrate deep into the tissue and rehydrate the skin from within. Then it creates a protective layer to keep feet soft and smooth. If you already have rough skin on your soles or the deep, painful cracks on your heels then you need to bring out the big guns and make sure to follow this foot care guide for men. Before you start using a cream for hard feet or a scrub, you should get as much of the layer of hard callused skin on the sole. It is a layer of dead skin that won’t allow any creams to absorb, so before you start a foot grooming routine it needs to come off. Using a microplane foot file like this Colossal Pedicure Rasp on Amazon.com is the best tool to get rid of calluses on your feet. Though this foot scraper may look like something you see either on the Food Network to zest a lemon, it is ideal for getting rid of calluses. While your feet are dry, then gently use this to scrape off the layer of calluses and dead skin. Avoid the spots where the skin is moist or tender as it doesn’t really have much dead skin. Use it on the rough spots until there doesn’t seem to be anymore skin coming off, or it just seems like the skin is getting tender. Once your foot is free of calluses, then you can do a foot soak or use some of the creams I already mentioned earlier. Curing a cracked heel can be done with a high quality cracked heels cream like this 40% Urea Cream by Amélie Monnier on Amazon.com. Urea is a powerful ingredient in eliminating hard skin, calluses and cracks in feet. At 40% this is about as high as it gets. Using this nightly will heal those heels in no time. It will soften your feet and leave them feeling healthy and plump. As well as easier to look at! If you really want to hedge your bets and get your foot care under control faster then follow this foot care guide for men and try these foot care socks that exfoliate and hydrate. Codreams Men’s Moisturizing Gel Socks from Amazon.com. These socks have a gel lining that contains Jojoba Oil, Lavender oil, Olive Oil and Grape Seed Oil. Put these on at night or wear around your house and let the oils work their magic. Just do a soak in Epsom salt first or use a foot scrub and then put these on to heal your feet fast. These can be washed and used over and over, but over time the oils will be gone. After you wash them, you can still use them, but use a good foot cream and then put them on. There is a layer of spandex inside that will keep the cream on your feet and keep your sheets clean if you decide to use them at night. The gel inside should last for a while even after washing, but it is tough to say how many washes you will get before the oils are depleted. I don’t recommend using pumice stones to get rid of the dead skin on your feet. They do work well, but they also can trap bacteria in the holes which is no bueno. Use the tools I reviewed here and you won’t need any of those stones anyway. The number one, most effective thing you can do to keep your toenails healthy is to trim them. Long toenails can crack and collect fungus. They take a beating from your shoes that end up damaging them which can leave them looking yellow and gross. Use a good toenail clipper and trim them every 2 weeks to keep them from getting too long. Kohm CP-240L Toenail Clipper for Thick Nails on Amazon.com are the best men’s toenail clippers that I know of, so if you are looking for a good pair then try these ones out. Once they are trimmed and neat, you need to strengthen them. Strong toenails will resist breaking and are less likely to get infected with fungus. The best nail strengthener is argan oil. No need for a special one for nails, just get the pure extra virgin argan oil from Amazon.com and you can use it on your hair, fingernails and any rough skin on your body, as well. Use the dropper to apply a dab of oil then rub it in on your toenails. After a few weeks of doing this and following this foot care guide for men, you will notice the nails are stronger and look a healthy pink color. If you already have a toenail fungus then treat it to get them back on track and then use the argan oil to strengthen and nourish them. 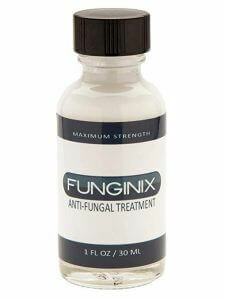 Start off by using Funginix Toenail Fungus Treatment from Amazon.com to get rid of the infection. Toenail fungus is as stubborn as a mule. It may take a while, up to a few months even, to fully get rid of it. But this product is maximum strength and will do the job if you give it time. In fact, it does work faster than other toenail fungus treatments. The best cure is prevention, which goes for anything, but especially athlete’s foot. If you follow the steps laid out earlier in this foot care guide for men for remedies for stinking feet, then you will likely be able to avoid athlete’s foot before it becomes a problem. Keeping your feet free from fungus and bacteria after the gym can keep your feet free from fungus. If you already have a bout of that painful, burning athlete’s foot, then try this Funginix AF Athletes Foot Cream from Amazon.com. It’s maximum strength so it can handle just about any fungus that your foot has. Its main ingredient is tolnaftate, which is powerful against fungus. Then camphor oil soothes the burning and redness. Tea tree oil will act as an antiseptic and keep the skin from getting infected again. To keep from getting athlete’s foot again, make sure you aren’t walking barefoot in the showers at the gym or pool where that fungus is hiding. Even better are aqua socks on Amazon.com. Even though they aren’t marketed as a shower shoe, I think they protect best on gym showers since infected water can still splash up on your feet when you wear flip flops. Once you are dried off and out of the shower, give your feet a spray with Lotrimin AF Athlete’s Foot Deodorant Antifungal Powder Spray from Amazon.com. This will act as insurance against any bacteria or fungus that might have reached your feet even if you took all the right precautions at the gym. Take a holistic approach to your corn removal and foot care routine by soaking your feet with the Epson salt soak I described earlier. This is the best way to start any foot grooming treatment, really. After your feet are cleaned and soaked, they are ready to absorb the ingredients from a good corn remover. I like Dr. Scholls Corn Removers Cushions Medicated Disks on Amazon.com. One of the worst things about having corns is how they hurt since they rub against your shoes. These disks are cushioned so they feel really comfortable while the treatment works to get rid of the corns. And it gets rid of corns fast. In some cases overnight. They use salicylic acid to keep the corns from being painful while they are treated. Taking care of your feet at home by following this foot care guide for men is the best way to keep your feet healthy. If you want to rock the sandals and flip flops this summer, then make sure they are presentable. Not only that, but your feet deserve some love, too. And doing a foot soak and using foot care products can give your sense of well being a big boost. When your feet feel good, you feel good. And, for whatever reason, when you maintain your feet, you really feel like you are spoiling yourself. Let’s clear up that misconception once and for all, that taking care of yourself as a man means that you are spoiling yourself. You deserve to feel good and look good and doing any kind of grooming treatment is essential. Don’t feel like you are spoiling yourself by doing what is necessary to keep yourself well groomed.